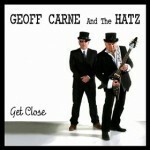 Share the post "Album review: GEOFF CARNE AND THE HATZ – Get Close"
At times it’s hard to believe that Geoff Carne and his long time musical partner Mick Hatz are only a duo, but having taken their inspiration from the likes of The White Stripes, they pursue a rip-roaring garage band style of rocking blues that places the emphasis on fuzz box energy and good hooks. The more you listen to ‘Get Close’ the more you warm to their well written and subtly mixed rocking blues style. They work hard to finds a balance between their natural exuberance and producer Paul Mex’s bigger sonic vision. Geoff Carne And The Hatz are at their best when they rock out and groove on ‘Giving Me The Blues’, which is a fine example of Carne’s expressive, alliterative phrasing and guitar driven rocking blues. The ballad ‘Another Piece Of Me’ provides a major stylistic diversion with a catchy ‘oooh’ refrain. It doesn’t quite capture the grandeur it searches for, but it certainly brings contrast and coherence to the album’s sequencing. Carne also has a strong enough vocal range to dominate his material and drive his lyrics home, while Mick Hatz locks into the grooves and punctuates some impressive riff driven rock with muscular percussion. ‘Out To The Country’ is an expansive opener with a trademark fuzz led groove, while ‘Lost In You’ is a ripping slice of rock and roll that is topped by buzz guitar, effective harmonies and a hook that somehow reflects the title. Carne’s energetic style is best encapsulated by the hard driving ‘Shot Down In Ten’, which is full of big cymbal splashes, dirt sounding guitar and a very catchy descending hook. Some of the songs are self evidently riff driven – check out the tension building drone of the splendid ‘Nine Miles To The Border’ – while Carne’s distorted guitar tones and clanging choruses sometimes owe a debt to Neil Young. It’s a style that isn’t pursued consistently though, mainly because as Geoff explains on his web site, the singles are recorded as a full band, while the album tracks revert to the duo mode. The latter seems to explain the Spartan title rack on which his vocal draws us in the lyrics on the back of a hypnotic rhythm. Significantly he chooses to bookend the album with a stripped down version of the title track, which focusses on voice and electric piano, to once again draw the listener into the lyrics. ‘Whatever Will Be’ doesn’t quite fulfil its opening blustery potential, as the belligerent cymbal splashes fail to disguise a lack of the kind of drive that makes the earlier efforts so vital. ‘Who’s Foolin’ Who?’ on the other hand, benefits from the opening hook as the duo snap into a purposeful groove and it’s given a different feel by Carne’s clean guitar lines. This entry was posted in ALBUM REVIEWS, ALBUM REVIEWS (Mobile), All Posts and tagged album, blues, Geoff Carne And The Hatz, Get Close, guitar, Mick Hatz, Neil Young, Paul Mex, review, rock, song writer, The White Stripes. Bookmark the permalink.